Walmart selling Sprint BlackBerry Torch 9850 for $99 | BlackBerry Blast! 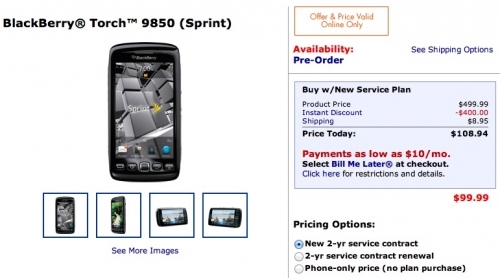 The Sprint BlackBerry Torch 9850 is going to be launched tomorrow, but you'll have to pay $150 if you go to Sprint. Walmart has stepped in with a much more reasonable $99 price tag. To get the $99 you'll have to purchase your BlackBerry Torch online, and of course, sign up for a 2-year agreement. Not bad Walmart. At least someone is offering these new BlackBerrys for a reasonable price!